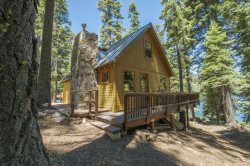 Our home is a great place to stay when exploring Lake Tahoe any time of the year. Come home after a day of skiing, hiking or biking and relax by the fireplace and entertain your guests in the open living room with views of Lake Tahoe. Or right out the doors you can play in the water and enjoy the afternoon on the grass. Now it’s cocktail time and the gas BBQ is awaiting your delicious dining option for the night. The master bedroom is complete with a Jacuzzi tub and private balcony that also look out to the lake. "When we come back to Lake Tahoe again, this will definitely be the first property we look at for availability. And I would definitely recommend to others to use Pyramid Peak Properties for their rental needs. We really appreciated the early check-in option for a reasonable fee." "We were very satisfied with our stay. Thank you for that!" "The stay at the house was fantastic! The views were incredibly and we felt right at home." This duplex features 2 bedrooms, 1.5 bathrooms, cable TV, DVD player, gas fireplace, full kitchen, washer and dryer, Jacuzzi tub in master bedroom, balcony off master bedroom, patio off living room with a gas bbq and access to a shared private dock. This home is right on the lake with unobstructed views. Your patio area is buffered with a grassy section and the lake is accessible for swimming. With over 1,440 square feet you will find a very comfortable space to entertain and unwind. The master bedroom has a king bed, the second bedroom has a queen and the living area with a queen sofa bed. The living room has a fireplace, flat-screen tv w/ dvd player. Wifi is available and a well equipped kitchen. The location and view was way more than I expected. Would recommend and stay again. Very friendly and available if needed. Stay was perfect - was a little disappointed that there was no beach - I think the photo is very old, however, enjoyed the dock. MANAGER RESPONSE: This home has no real beach, what is in the photos is actually lake bed from the drought. We have added some current photos of lake level. Your team was wonderful when I called about concerns, it was addressed quickly. Upon our arrival, a new microwave was delivered with an apology for the intrusion without us needing to ask. When I did raise a concern for maintenance, the staff was very positive and receptive, thanking me for the feedback. The property is wonderful. We have registered to come back for an even longer stay next year. The Condo was in excellent shape. It was an excellent experience. We would certainly book again. The home and view are absolutely beautiful, and exactly as represented. We highly enjoyed our stay. Staff is very pleasant and professional. The property was clean and well appointed. View was incredible. Great property and what a view, can't wait for my next time off. We will definitely use your company again. Tahoe is one of the great places on Earth. Last visit we stayed in Tahoe City and this property was even better. Being directly on the lake cannot be beat. The "sleeps six" is a bit tough because the pull out couch/bed is difficult for more than a night or two. Our family of 5 stayed with you for 2 nights. We loved it so much we wanted to stay longer. We're already planning our return trip; wanting to stay a full week next time. The waterfront view could not be beat. It was close to Safeway, shopping, restaurants, Regan beach, yet it was really quiet at the property. A fantastic get away!!! It was the absolute highlight of our 10 day road trip. PERFECTION!! The kitchen didn't offer bowls conducive for cereal. We also never found a spatula. One more thing; we had only 6 towels which meant we had to do laundry while there. More towels/hand towels would have been nice. MANAGER RESPONSE: We will be sure to stock the kitchen for cereal bowls and a spatula. Regarding towels, we are always happy to bring more during your stay. The location and cleanliness of the condo were excellent. It was very peaceful and had beautiful views of the lake. I would definitely stay again. We loved this property. Came for holiday with 3 young kids. It was so convenient, clean and views breathtaking. Next door neighbors were beyond friendly. Love this location. Tried blending something and top for blender was missing. But was able to use a dish to cover. MANAGER RESPONSE: We will either find the blender top or purchase a new one. This property was perfect for our stay. Easy to access surrounding activities. Parking was fine, we had just 1 vehicle. We were pleased that paper products were provided; as well as all the soaps, detergents, etc. We could not locate any flashlights - even though we were told there was to be one somewhere. We did locate a cabinet with a couple candles - there was 1 wooden match in a box - thank goodness it worked. So you will need to replace matches & supply a flashlight or two. We have rented places all over the country and this experience was most pleasant. MANAGER RESPONSE: We will make sure flashlights are made obvious to future guests. Thank you for letting us know. Property location was excellent with great views of Lake Tahoe. Lots to do in South Lake Tahoe. Peaceful, secluded lakefront property well maintained. Hope to do it again someday. I chose to have a relaxing weekend in one of my favorite places for my bachelorette party. A few of my girlfriends and I did not even want to leave the property it was so gorgeous. The view and private dock was amazing and the updated interior decor made for quite the cozy stay. We were very sad to leave! Great place! Very clean & comfortable. Good location. Had a wonderful stay! Check-In begins at 4:00 PM and Check-out is by 11:00 AM.